WOULD YOU GIVE EVERYTHING FOR YOUR JOB? The past two weeks in Boston have been harrowing to say the least. At first we all in the Boston area had our televisions leading to “Breaking News” on March 26th. With pictures of flames engulfing a brownstone in the Backbay section of town, we were all alerted to the severity of what was going on. All of the local stations were on the scene with differing angles of the blaze that was being fought. None of the camera crews were allowed too close to the fire due to the uncontrolled nature of the blaze. They were all held back at least a couple of city blocks away. It seemed as though time was moving at a snails pace as we all just sat and watched the blaze gaining strength with the assistance of a strong March wind. After what seemed an eternity we received word that they were taking some of the firefighters to Mass General Hospital since they sustained injuries while fighting this blaze. We only got to see a glimpse of a stretcher that had firefighters standing around it. It was evident that someone was performing CPR on the person who was lying there. It turned out that that person was a firefighter. He was transported to MGH but did not survive his injuries sustained in the fire. As I heard the news my heart sank. For just one moment we were all praying that they were going to say he survived. But that was just the beginning of the bad news for the day. It turned out that he was not the only fatality of the day. On April 2nd we all watched our local stations to join in remembering the two firefighters who gave everything for their jobs. 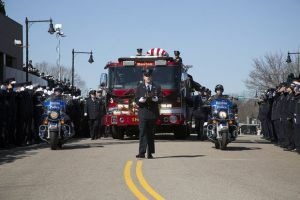 Their families and friends had all gathered to remember the two firefighters and all they had contributed during their lives as members of their community as well as loved ones that were held dear. As I watched the procession to and from the church, it came to mind that we all do not give everything for our jobs. There are but a few among us who go out out front doors on our way to work with the understanding that we might not make it back at the end of our day. It takes an enormous amount of courage and a heavy dose of self sacrifice to live with that reality on a day to day basis. From this I hope you can gain a new sense of importance on being grateful for everything and everyone in your life as it is right at this moment! This moment only happens once!